John Maynard Keynes, 1st Baron Keynes (pronounced kānz / kAnze) (June 5, 1883 – April 21, 1946) was a British economist whose theories, termed "Keynesian economics," had a major impact on modern economic and political theory as well as on many governments' fiscal policies. He is particularly remembered for advocating interventionist government policy, by which a government would use fiscal and monetary measures in attempts to mitigate the adverse effects of economic recessions, depressions, and booms. In particular, he advocated for government-sponsored employment opportunities to reduce unemployment and, thus, remedy any economic recession. Due to the popularity and revolutionary nature of such ideas, Keynes is considered one of the founders of modern theoretical macroeconomics, although many of his ideas did not stand the test of time. His popular expression, "In the long run we are all dead," is still quoted today. 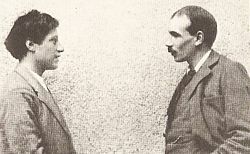 John Maynard Keynes was the son of John Neville Keynes, an economics lecturer at Cambridge University, and Florence Ada Brown, a successful author and a social reformist. His younger brother Geoffrey Keynes (1887–1982) was a surgeon and bibliophile, and his younger sister Margaret (1890–1974), married the Nobel Prize–winning physiologist Archibald Hill. Keynes enjoyed an elite early education at Eton, where he displayed talent in nearly every field of his unusually wide-ranging interests. His abilities were remarkable for their sheer diversity. Keynes was very tall, standing at approximately 6' 6" (200 cm). He entered King’s College, Cambridge, to study mathematics, but his interest in politics led him towards the field of economics, which he studied at Cambridge under A.C. Pigou and Alfred Marshall. Painter Duncan Grant with Keynes. From 1908 until 1915, Keynes maintained a relationship with the Bloomsbury painter Duncan Grant. Though the relationship would eventually end, Keynes continued to assist Grant financially for the rest of his life. In October 1918, Keynes met Lydia Lopokova, a well-known Russian ballerina. The two soon married and enjoyed a happy marriage until his death. Keynes was ultimately a successful investor building up a substantial private fortune. He was nearly wiped out following the Stock Market Crash of 1929, but soon recouped his fortunes. Keynes enjoyed collecting books and during his lifetime collected many of Isaac Newton's papers. His personal interests included literature and drama, and Keynes lent significant financial support to the Cambridge Arts Theatre, which ultimately allowed the institution to become a major British stage outside of London. Keynes had a fearsome reputation as a talented debater, with Friedrich von Hayek refusing to discuss economics matters in person with him several times. However, after reading Hayek's The Road to Serfdom, Keynes stated, "In my opinion it is a grand book…. Morally and philosophically I find myself in agreement with virtually the whole of it: And not only in agreement with it, but in deeply moved agreement." Hayek believed Keynes was in agreement "because [Keynes] believed that he was fundamentally still a classical English liberal and wasn't quite aware of how far he had moved away from it. [Keynes] basic ideas were still those of individual freedom. He did not think systematically enough to see the conflicts." Bertrand Russell named Keynes as the most intelligent person he had ever known, commenting: "Every time I argued with Keynes, I felt I was taking my life in my hands." In 1946, Keynes ultimately died of a heart attack, his heart problems being aggravated by the strain of working on post-war international financial problems. John Neville Keynes (1852–1949) outlived his son by three years. Keynes prestigious nephews include Richard Keynes (born 1919), a physiologist; and Quentin Keynes (1921–2003), an adventurer and bibliophile. Keynes accepted a lectureship at Cambridge in economics funded personally by Alfred Marshall, from which position he began to build his reputation. Soon he was appointed to the Royal Commission on Indian Currency and Finance, where he showed his considerable talent at applying economic theory to practical problems. Keynes' expertise was in demand during the First World War. He worked for the Adviser to the Chancellor of the Exchequer and to the Treasury on Financial and Economic Questions. Among his responsibilities were the design of terms of credit between Britain and its continental allies during the war, and the acquisition of scarce currencies. At this latter endeavor Keynes’ “nerve and mastery became legendary,” in the words of Robert Lekachman, as in the case where he managed to put together—with difficulty—a small supply of Spanish pesetas and sold them all to break the market: It worked, and pesetas became much less scarce and expensive. Keynes' career lifted off as an adviser to the British finance department from 1915 to 1919, during World War I and their representative at the Versailles peace conference in 1919. His observations appeared in the highly influential book The Economic Consequences of the Peace in 1919, followed by A Revision of the Treaty in 1922. He argued that the reparations that Germany was forced to pay to the victors in the war were too large, would lead to the ruin of the German economy, and result in further conflict in Europe. These predictions were borne out when the German economy suffered the hyperinflation of 1923. Only a fraction of reparations were ever paid. Keynes published his Treatise on Probability in 1921, a notable contribution to the philosophical and mathematical underpinnings of probability theory. He attacked the deflation policies of the 1920s with A Tract on Monetary Reform in 1923, a trenchant argument that countries should target stability of domestic prices and proposing flexible exchange rates. The Treatise on Money (1930, 2 volumes) effectively set out his Wicksellian theory of the credit cycle. Keynes’ magnum opus, General Theory of Employment, Interest and Money, challenged the economic paradigm when published in 1936. In this book, Keynes put forward a theory based upon the notion of aggregate demand to explain variations in the overall level of economic activity, such as were observed in the Great Depression. The total income in a society is defined by the sum of consumption and investment; and in a state of unemployment and unused production capacity, one can only enhance employment and total income by first increasing expenditures for either consumption or investment. The total amount of saving in a society is determined by the total income and thus, the economy could achieve an increase of total saving, even if the interest rates were lowered to increase the expenditures for investment. The book advocated activist economic policy by government to stimulate demand in times of high unemployment, including spending on public works. The book is often viewed as the foundation of modern macroeconomics. Historians agree that Keynes influenced President Roosevelt's New Deal, but differ on the extent of Keynes' influence. Deficit spending of the sort the New Deal began in 1938 had previously been called "pump priming" and had been endorsed by President Herbert Hoover. Few senior economists in the U.S. agreed with Keynes in the 1930s. With time, however, his ideas became more widely accepted. In 1942, Keynes was a highly recognized economist and was raised to the House of Lords as Baron Keynes, of Tilton in the County of Sussex, where he sat on the Liberal benches. 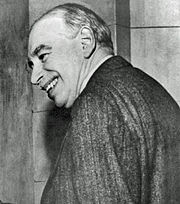 During World War II, Keynes argued in How to Pay for the War that the war effort should be largely financed by higher taxation, rather than deficit spending, in order to avoid inflation. As Allied victory began to look certain, Keynes was heavily involved, as leader of the British delegation and chairman of the World Bank commission, in the negotiations that established the Bretton Woods system. The Keynes plan, concerning an international clearing union, argued for a radical system for the management of currencies, involving a world central bank, the Bancor, responsible for a common world unit of currency. The stronger negotiating position enjoyed by the United States following World War II resulted in the final outcomes of Bretton-Woods being far less radical than what Keynes had sought. Keynes also published a series of Essays in Biography and Essays in Persuasion, the former giving portraits of economists and notables, while the latter presents some of Keynes' attempts to influence decision makers during the Great Depression. Keynes was editor-in-chief for the Economic Journal from 1912. Keynes' brilliant record as a stock investor is demonstrated by the publicly available data of a fund he managed on behalf of King's College, Cambridge. From 1928 to 1945, despite taking a massive hit during the Stock Market Crash of 1929, Keynes' fund produced a very strong average increase of 13.2 percent compared with the general market in the United Kingdom, which suffered a decrease by an average 0.5 percent per annum. Keynes argued that "It is a mistake to think one limits one's risks by spreading too much between enterprises about which one knows little and has no reason for special confidence… One's knowledge and experience are definitely limited and there are seldom more than two or three enterprises at any given time in which I personally feel myself to put full confidence." When reviewing an important early work on equities investments, Keynes argued that "Well-managed industrial companies do not, as a rule, distribute to the shareholders the whole of their earned profits. In good years, if not in all years, they retain a part of their profits and put them back in the business. Thus there is an element of compound interest operating in favor of a sound industrial investment." The strength of Keynes' influence can be seen by the wave of economists who have based their own analysis on a criticism of Keynesianism. Keynes’ 1930 publication of the two-volume Treatise on Money took its harshest criticism from free market economist and philosopher Friedrich von Hayek. Hayek, a professor at the London School of Economics, criticized Keynesian economic policies for what he called their fundamentally collectivist approach, arguing that such theories, in spite of their presumptively utilitarian intentions, required centralized planning that would ultimately lead toward centralized control and abuse. Hayek claimed that what may start as temporary governmental solutions may often become permanent and expanding government programs that may prove to stifle the private sector and civil society. Keynes himself described Hayek’s critique as "deeply moving," which was quoted on the cover of Hayek’s 1944 Road to Serfdom. A second school of Keynesian criticism began in the late 1940s with monetarist Milton Friedman. Instead of rejecting macro-measurements and macro-models of the economy, the monetarist school embraced the techniques of treating the entire economy as having a supply and demand equilibrium. Followers also regarded price inflation as being solely due to variations in the money supply, rather than a consequence of aggregate demand. They argued that the "crowding out" effects of Keynesianism would hobble or deprive fiscal policy of its positive effect. Instead, monetarists agreed the focus should be set on monetary policy, which they believed to be largely ignored by early Keynesians. Monetarism had an ideological as well as a practical appeal: Monetary policy does not, at least on the surface, imply as much government intervention in the economy as other measures. The monetarist critique pushed Keynesians toward a more balanced view of monetary policy, and inspired a wave of revisions to Keynesian theory. A third influential school of thought was formed from the Lucas critique of Keynesian economics. This school drew heavily on developments in microeconomic theory, in particular the Keynesian idea of rational expectations. Lucas and others argued that Keynesian economics required remarkably foolish and short-sighted behavior from economic agents, which ultimately contradicted the economic understanding of consumer behavior at a microeconomic level. In a further attempt to assuage such differences, new classical economics introduced a set of macroeconomic theories that were based on optimizing macroeconomic behavior, for instance the real business cycles. American economist James Buchanan followed such criticism by noting that, since Keynes had roots in the classically liberal or free market economic tradition, he was more concerned with what constituted good policy, and not on how it would be executed. The Anarcho-capitalist economist Murray Rothbard was also hugely critical of Keynes. His essay, Keynes, the Man, is a scathing attack upon both Keynes’ economic ideas and personage. Contemporary with Keynes was Joseph Schumpeter whose approach, radically different to that of Keynes, was overshadowed by Keynes during their concurrent lifetime. Keynes regarded the economy as a closed system, that, when healthy, is in static equilibrium, but Schumpeter rejected equilibrium as healthy and regarded innovation as the basis of a healthy economy. For Schumpeter, dynamic disequilibrium is key and the economy is likened to a growing, living organism rather than a machine. While Keynes concluded that a permanent equilibrium of full employment and prosperity could be achieved by government control—government spending, the volume of credit, or the money supply—Schumpeter saw government intervention as increasing inflation until capital would be consumed and both capitalism and democracy destroyed. For Schumpeter, the entrepreneur who moves resources from old, obsolescent technology and the firm that invests in developing new ideas providing new employment are essential to the health of the economy. But, for Schumpeter, innovation is also "creative destruction," as the new makes obsolete the old. Keynes was famous for his saying, "in the long run we are all dead," but it was Schumpeter who saw that short-term measures have long-term impacts. Keynes, considered the father of macroeconomics, and listed in Time as one of the most important people of the twentieth century, is perhaps best known for his main work General Theory of Employment, Interest, and Money. Within this piece, Keynes recorded his thoughts on employment, monetary theory, and the trade cycle among others. His work on employment went against everything that the classical economists had taught. Keynes believed the real cause of unemployment to be insufficient investment expenditure. He believed that the amount of labor supplied is different when the decrease in real wages (the marginal product of labor) is due to a decrease in the money wage, than when it is due to an increase in the price level (assuming money wages stay constant). In his General Theory, Keynes said that savings and investment were independently determined. The amount saved had little to do with variations in interest rates which in turn had little to do with how much was invested. Keynes thought that changes in saving depended on the changes in the predisposition to consume, which resulted from marginal, incremental changes to income. Therefore, investment was determined by the relationship between expected rates of return on investment and the rate of interest. Keynes' arguments presented within the General Theory are continuously studied by contemporary economists. These theories were so influential, even when disputed, that a subfield of macroeconomics known as Keynesian economics has further developed and discussed Keynesian theories and their applications. John Maynard Keynes, maintaining several cultural interests, was also a central figure in the so-called Bloomsbury group, consisting of prominent artists and authors throughout Great Britain. His autobiographical essays, Two Memoirs, appeared in 1949. Keynes, John M.  2005. The Economic Consequences of Peace. New York: Cossimo Classics. ISBN 1596052228. Keynes, John M.  2004. A Treatise on Probability. New York: Dover Publications. ISBN 0486495809. Keynes, John M.  2006. A Revision of the Treaty. New York: Cossimo Classics. ISBN 1596058943. Keynes, John M.  2004. The End of Laissez-faire. Prometheus Books. ISBN 1591022681. Keynes, John M.  1976. A Treatise on Money. AMS Press. ISBN 0404150004. Keynes, John M. 1983. The Collected Works of John Maynard Keynes: 29-volume Set. Palgrave Macmillan. ISBN 0333358279. ↑ Thomas W. Hazlett, The Road from Serfdom, Foreseeing the Fall, Reason Magazine, July 1992. Retrieved April 14, 2007. ↑ John M. Keynes, The Collected Works of John Maynard Keynes: 29-volume Set (Palgrave Macmillan, 1983), 252. ↑ Murray N. Rothbard, Keynes, the Man, Ludwig von Mises Institute. Retrieved April 20, 2007. ↑ Peter Drucker, Modern Prophets: Schumpeter and Keynes? Texts by Peter Drucker (1983). Retrieved March 21, 2007. ↑ Robert B. Reich, TIME 100: John Maynard Keynes, Time. Retrieved April 20, 2007. Holroyd, Michael. 1995. Lytton Strachey. Norton. ISBN 0393327191. Keynes, Milo. 1975. Essays on John Maynard Keynes. Cambridge University Press. ISBN 0-521-20534-4. Skidelsky, Robert. 1992. John Maynard Keynes: Hopes Betrayed 1883–1920. Papermac. ISBN 033357379X. Skidelsky, Robert. 1994. John Maynard Keynes: The Economist as Saviour, 1920–1937. Papermac. ISBN 0333584996. Skidelsky, Robert. 2001. John Maynard Keynes: Fighting for Britain, 1937–1946. ISBN 0333779711. Yergin, Daniel, and Joseph Stanislaw. 1998. The Commanding Heights: The Battle for the World Economy. New York: Simon and Schuster. ISBN 0684829754. History of "John Maynard Keynes"
This page was last modified on 21 May 2018, at 14:53.